Anyone who knows me can attest to the fact that I'm not much of a morning person, but I know that when I had a job-related work or an appointment that required me to get up much earlier than most sane people would choose to, I'll get a good night sleep by going to bed earlier. However, you know those days when you try to get up as late as possible, keep pressing your snooze button, and you end up oversleeping. On days like these, there's no time for breakfast! I've just enough time to shower and slap some makeup on. Just like yesterday, I was short on time, so I revived my day with Baskin-Robbins’ new and refreshing Yogurt Smoothies, made with fruit concentrates and frozen yogurt that contains live and active cultures! Baskin-Robbins, the ultimate indulgence, now introduces a New Yogurt Smoothie, perfect for the youthful active and healthy lifestyle. The smoothies are the perfect on the go beverage, for those looking for a "BRight Choice" which is packed with great taste! The new beverage is available in four different flavors - Strawberry, Strawberry Banana, Mango and Mixed Berries - each concocted to tantalize your taste buds. These flavors are blended with frozen yogurt for true smoothies’ goodness. The moment you take a sip, the sweetness of the concentrate made with real fruit immediately fills the palate, leaving a pleasurable aroma to savor. The tanginess and fulfilling flavor in each drink will perk you up almost instantly; awakening your senses but ultimately, these harmonious flavor combinations will rejuvenate and quench your thirst, giving you a fruity way to satisfy your sweet tooth. With the presence of live and active cultures in these delightful smoothies, the health benefits are aplenty! Not only do they prevent gastrointestinal infections, live and active cultures are known to boost the immune system, reduce cholesterol, fight certain types of cancer and prevent osteoporosis. Additionally, the live and active cultures found in yogurt break down lactose in milk, which allow individuals who are mild lactose intolerant to truly enjoy and receive nutrients contained in milk products without the side effects. The new Yogurt Smoothies also make satisfying snacks for those leading busy lifestyles. When you are constantly on the go, a Baskin-Robbins Yogurt Smoothies can fill you up and keep you running until your next meal. 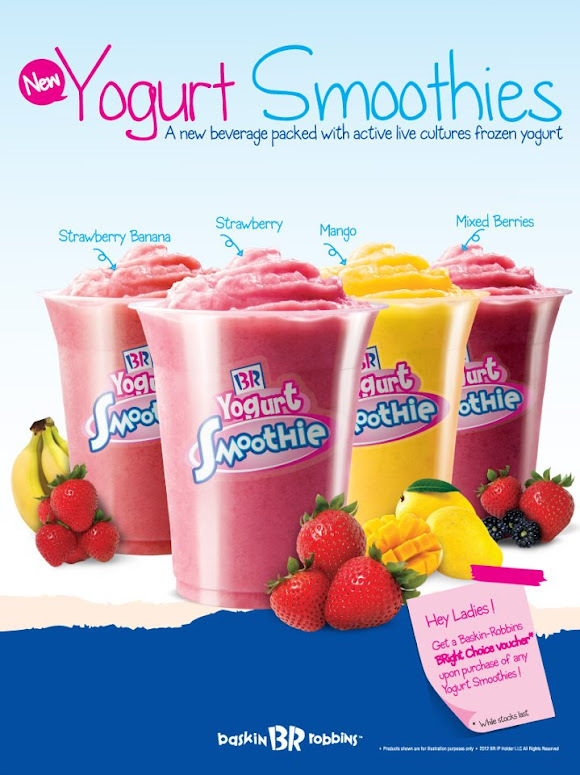 Each delicious Yogurt Smoothies is priced at RM16 for a regular size and RM12 for small size. All smoothies are subject to 6% government service tax. As International Women's Day draws near on 8 March 2012, Baskin-Robbins aims to celebrate, commemorate and salute women for their achievements and contributions. For this, Baskin-Robbins is offering every female a BRight Choice voucher upon the purchase of any Yogurt Smoothie! The voucher entitles each female customer the ability to size up from a junior to a regular scoop in their next purchase of any Baskin-Robbins BRight Choices flavor, which includes frozen yogurts, reduced fat and no sugar added ice creams. The offer is valid at all Baskin-Robbins stores throughout Malaysia from 1 March 2012 to 30 April 2012. "Let's start the day with a tasty smoothie!" Oh, it's 3.30am. Guess who is still awake!